Affordable Housing Streamlined Approval Process: Who Should be in Charge? California Senator Scott Wiener (Senatorial District 11 – San Francisco and north San Mateo) has introduced Senate Bill 35, Affordable Housing: Streamlined Approval Process, which is set for committee hearing on February 28, 2017. The Planning and Zoning Law requires a city or county to adopt a general plan for land use development within its boundaries that includes, among other things, a housing element. Existing law provides for various incentives intended to facilitate and expedite the construction of affordable housing. Existing law requires the Department of Housing and Community Development to determine existing and projected needs for housing for each region and, in consultation with each council of governments, adopt a final regional housing plan that allocates a share of the regional housing need to each city, county, or city and county that meets specified requirements. Streamlining housing approvals during a housing shortage. * The development is an accessory dwelling unit development or a multifamily housing development that contains two or more residential units. * Is an urban infill site. * The site is zoned for residential use or residential mixed use development. * The development is located in a locality that, according to its last annual production report to the Department of Housing and Community Development, completed construction of fewer units of housing by income category than was required for the regional housing needs assessment cycle for that year. * The development is not located in a coastal zone; is not farmland or wetland; is not located within a very high fire hazard, earthquake, hazardous waste, or flood zone; and will not require the demolition of housing that is rent controlled, deed restricted, occupied by residents within the past 10 years, or is a historic structure. So What Does SB 35 Really Accomplish? A discussion of what in economics theory constitutes a “shortage” and what role price has in producing or eliminating “shortages” would be interesting, but outside the scope of this simple bill alert. Our focus at present is only to share the basics of SB 35, and suggest a perusal of the vast amount of policy-protected land in California that serves to confine populations into housing-scarce priority development and transit oriented strips of land. A recent article in the Mercury News illustrates the challenge keeping people where the planners say they should be. SB 35 further cements the one-size-fits-all solution for the housing scarcity, and establishes a mandate rather than an incentive for compliance with the solution. This chart by the Greenbelt Alliance indicates that in 1989 709,600 acres were policy protected, and in 2017 1.2 million. For comparison, the population of the Bay Area in 1989 was 6 million, and in 2010 (latest census) 7.15 million. At the Board of Supervisors meeting of February 28, the Resolution to urge the California Legislature to allow cities to implement personal and corporate income taxes failed to pass. Eight "yes" votes were needed to pass, but there were only seven, with Supervisors London Breed, Mark Farrell, and Jeff Sheehy casting the "no" votes. Supervisor Hillary Ronen (District 9) requested the resolution be sent to the Government & Oversight Committee, where it will be heard on March 15, 2017, 10:00 am, Room 250, City Hall. San Francisco Supervisor Aaron Peskin at the Board of Supervisors Meeting of February 14, 2017, requested motion on amendments to Resolution Item #30 and continuance to meeting of February 28. For live stream records of San Francisco government meetings visit sfgovtv.org. Other cities and counties also have live streaming of council meetings. Notwithstanding any statute, ordinance, regulation, rule or decision to the contrary, no city, county, city and county, governmental subdivision, district, public and quasi-public corporation, municipal corporation, whether incorporated or not or whether chartered or not, shall levy or collect or cause to be levied or collected any tax upon the income, or any part thereof, of any person, resident or nonresident. This section shall not be construed so as to prohibit the levy or collection of any otherwise authorized license tax upon a business measured by or according to gross receipts. The Supervisors are further proposing that the Legislature introduce a bill similar to then-Assemblyman Mark Leno’s 2003 AB 1690. That bill ensured that any income tax levied could not be greater than 10% of an individual’s state income tax liability, and would need the approval of the local legislative branch and the voting public. AB 1690 died in committee possibly because of the bill’s complexity, economic burden on small businesses, and inequities within the state that would arise between high-income and low-income jurisdictions. The reason for the introduction of this resolution is to find “progressive revenue sources to fund the transportation and health and human services needs of the City’s growing population;” such action necessitated by a) San Francisco’s loss of federal funds due to sanctuary city status, and b) rescission of the Affordable Care Act. The search for a “progressive” revenue source is prompted by the heaps of negative press received last November by Proposition K, a “regressive” sales tax that was overwhelmingly rejected at the ballot box. It might be a while before the Supervisors dare to upset their liberal voter base by defying Bernie Sanders and his impassioned speeches opposing regressive taxation. San Francisco officials are determined to provide universal health care, now threatened by a possible repeal of the Affordable Care Act. A substantial steady stream of new funds supplied by a local income tax such as the one proposed by the more progressive members of the City's Board of Supervisors could be a remedy. Such a revenue stream could also prevent roads and transit systems from falling into further disrepair. However, it is doubtful that a City income tax would be earmarked for transportation and health and human services, and not simply go into the City’s General Fund. The local tax resolution proposed by San Francisco Supervisors, as amended, said that a corporation tax is an alternative to a gross receipts tax and allows for taxation on profits rather than on receipts. San Francisco is in the process of phasing out its tax on gross receipts and gradually replacing it with a tax on payroll. In the case of San Francisco, the proposed income tax would be an additional tax. At close to 9%, California’s corporation income tax is already among the highest in the nation. Liberal Calexit supporters, conservative enemies of the federal Housing and Urban Development empire, and many folks in between, would welcome more independence from the federal Government, which can only come with decreased dependence on federal grants. The Nine-County Coalition’s mission includes raising awareness of the importance of residents exercising control over their cities and counties. However, setting aside the obvious fact that residents are required to pay federal income tax regardless of the level of federal grants their cities and counties receive, there remains a danger that-tax-and-spend jurisdictions such as San Francisco will take advantage of voters’ perception of “crisis” and succeed in not only removing safeguards against profligate spending, but also erode what little control residents have left over their cities and counties. Watchfulness over developments such as San Francisco's income tax is in order, since results will affect not only the jurisdiction proposing the measure, not only the Bay Area, but the entire state. A recognition of challenges that will arise should federal block grants be withheld or the Affordable Care Act be repealed is also in order. And so is awareness that increased overall taxation is not the only solution. A better path might lie in trimming bureaucracies and budgets. At its meeting of February 28, 2017, Supervisors cast seven"yes" votes and three "no" votes. The measure failed. The City of Walnut Creek seems hell bent in putting a HFH [Habitat for Humanity] project on a two-acre site, with not enough parking and under BART tracks. It will mess up traffic around pleasant hill BART, and it is too dense for the neighborhood. The City Council seems to go along with this as they are afraid of the consequences of not doing it. Is this project part of ABAG’s quota for low cost housing? How can the neighborhood fight this? The project in question is a Transit-Oriented Development (TOD) adjacent to BART tracks near the Pleasant Hill/Contra Costa Center station. The site was purchased from Contra Costa County by HFH for $3 million in March 2016, acquisition and pre-development costs totaling $3.15 million financed by the City of Walnut Creek. Plans are for 10 buildings containing 45 condominium units of one to four bedrooms. The 16 units over the current 29-unit limit for the zone are allowed because all 45 units are 100% subsidized (affordable). Also, HFH is entitled to relief from the requirement to provide a minimum of one covered parking stall per unit. All units will count toward the City of Walnut Creek’s required allotment of subsidized housing. How the neighborhood fights this project, in our view, depends on how many people in the neighborhood are not happy with the project, how many are aware of the project’s background -- California Senate Bill 375, Plan Bay Area, Priority Development Areas, ABAG, Transit-Oriented Development Guidelines, and from the federal government HUD’s Affirmatively Furthering Fair Housing -- and how many are willing to form coalitions strong enough to make their voices heard at the ballot box in order to counter mandates from all the sources listed above. Who would not be happy with Transit-Oriented Development? The objective of TODs is to make people abandon their private vehicles, be happy with having to take public transit, and walk or bike to public transit stops. A principal tool of implementation is removal of parking spaces. Such strategy sounds great if your lifestyle fits into Transit Villages, where you live in relatively small quarters with no possibility of lemon trees or barbeque pits in a generous private back yard; or if you are happy to walk or bike at least six blocks to a transit stop. However, if you need to take your toddlers to day care before you hop onto a BART train to arrive at your work by 8:00 am, you might miss the disappearing parking spaces at BART stations. Do I need to know where TODs come from? There are so many layers of legislation behind TODs, that concern at a city and county level is only a start. The California Senate mandated sharp reduction of green-house gases with SB 375, Plan Bay Area was implemented at the regional level to carry on the mandates under SB 375, Priority Development Areas mandated under Plan Bay Area resulted in TODs, HUD’s AFFH rule requires that all communities have a diverse economic mix of residents, and culturally all this has been synthesized into the idea of “Sustainable Communities," described by the California Department of Transportation below. Such communities have become a Holy Grail, and are often described in equally obscure language. Sustainable communities programs generally include everything in most livable communities or smart growth programs. They are distinct in that they often include an explicitly global ("think globally, act locally") and long-term dimension ("..without compromising the ability of future generations to meet their own needs"). They tend to involve a more explicit view of the community as an important part of the larger world within which it functions, and they generally see the community as both having responsibility as a "global citizen" and as being significantly impacted by what happens on a global long-term basis. TOD initiatives benefit the livability of a community through: Increase in transit ridership; reduction in vehicle miles traveled (VMT); improved air quality; reduced need for a second auto; improved availability of affordable housing; improved jobs/housing balance; increase in walking; enhanced quality of life and economic development; reduction in infrastructure costs; and, preservation of farmland and open space. Specifically, sustainable communities programs are more likely than livable communities or smart growth programs to include or emphasize issues like global warming, endangered species protection, renewable energy development, or green design and building. While elements such as schools, crime, taxes, parks, libraries, and other urban services may not receive the same emphasis, it is often recognized that long-term sustainability objectives cannot be achieved unless the urban core and older suburbs are restored as places where families feel safe and the schools deliver a quality education. How do I fight all those layers of legislation? “Public comments” help, but we have yet to see public comments dent programs or projects significantly. However, a critical mass of informed and involved citizens can exercise control over their cities and counties via the ballot box. In the case of the project in question, the Walnut Creek City Council needs to be more afraid of being voted out of office than afraid of not following ABAG’s mandates. ABAG needs to be reminded that member counties can vote to end their membership. State legislators need to know that their jobs depend on how happy voters are with legislation they sponsor. Finally, voters need to think deep and hard each time they vote to give more of their hard-earned money away. It is difficult to stop a project once it is in the works and has money to proceed. But in this case, the project is in its very early stages, and redesign to include demand-based parking is still possible. More parking or everybody gets voted out? Sometimes just providing an “About Us” is not enough for visitors to websites to get a good sense of what is going on. The Nine-County Coalition “About Us” can indicate the group’s origins and objectives; however, the heartfelt description below, written by one of our group’s participants, can say so much more. Please read with special care the points summarizing “extent and consequences” of regional sustainable development. The words “sustainable development” look good on paper, and “regionalism” sounds like good old economies of scale; however, legislation purportedly designed to implement these twin objectives carries significant consequences often hidden under a flood of environmental, equity, and economy-related rhetoric. Should you also want to contribute your ideas on the subject of regionalism, tell us about yourself and/or your organization, let us know what you think, use our "Contact" form. *abolition of private person, private property and private affairs. *inventory and control of all natural, human and financial resources through use of the three E's: environment, equity, economy and associated 'impact' statements. *transition from appropriative rights (what you want and can pay for) to allocated rights (what the government decides you will get), implemented progressively through conservation programs (government created scarcity of resources). *federal jurisdictional overlay upon our State of California, as 'CA' ZIP=zone improvement plan; referred to as an 'administrative subdivision of federal government.' "
These are thoughts on which to ponder, and we hope you will remember these points before you vote “yes” on the next regional proposal on your ballot. Consider working towards a beautiful San Francisco Bay Area, where challenges are met without throwing away babies with bathwaters. A special version of Yes In My Back Yard land-use planning has dominated the California landscape for the past decade. Problem is, this version of YIMBYness, which mandates lots of people be crowded in small areas, has predictably resulted in astronomical housing costs, destruction of what residents see as their neighborhood character, and creation of armies of bureaucrats out of voters’ reach orchestrating the grand design. Proposition I, Mission District Moratorium, supported by San Francisco Supervisor David Campos, would have placed an 18-month district-wide moratorium on luxury development: defeated by voters November 2015. Measure LV, Santa Monica Land-Use Voter Empowerment Initiative, would require developers to obtain voter approval of projects containing buildings taller than 32 feet: defeated by voters November 2016. On the March 2017 ballot in the City of Los Angeles: Measure S, The Neighborhood Integrity Initiative, which calls for no zoning changes to accommodate new projects until the City Council redraws its planning documents to allow for more transparency in project approvals, stricter environmental studies, plan updates every five years, and an end to developer-generated city planning – a form of corruption in the eyes of Measure S supporter. Whether voters approve Measure S or not is not as significant as the fact that some people are willing to invest time and treasure stopping top-down mandates they view as having a negative impact on their lives. Any city or county could look into the possibility that overly-large tax incentives, political contributions, developer-influenced environmental studies might all be symptoms of a "For Sale" sign on their City Hall or County Seat. The Metropolitan Transportation Commission website is a treasure trove of information regarding just about all the central planning that goes on in the San Francisco Bay Area. One of the website’s more interesting features is “Maps of the Month.” The map above was November’s, and it shows the top 30 transportation taxes nationally that passed or failed during the November 2016 elections. If you have really good eyes, you will be able to read the legend on the bottom left side of the map, which says “Growing movement toward state and local ‘Self-Help’ funding transportation infrastructure throughout the United States." While the state fiddles, local governments are taking action—and it’s at the local and regional level that the next generation of transportation solutions must be devised. Taxpayers in 21 counties already pay for a sizable portion of their own transportation systems. These so-called “self-help” counties have approved $4 billion a year in local sales tax measures for everything from highway tunnels and transit extensions to local roads. Those numbers are about to get a lot bigger. “Local” decision making is great. However, the challenge arises when 1) unelected regional bureaucrats make decisions for us, 2) cost of infrastructure that benefit a few specific counties is spread throughout all nine counties, and 3) local taxes go up, but state and federal taxes do not go down. These challenges are not hopeless; voters just need to be a little more careful at the ballot box. What Price Preservation of Housing? It appears that the San Francisco Bay Area cannot make up its mind whether it wants to be an economic powerhouse or a home for quaint locales. “Neighborhood character” might be a consummation devoutly to be wished by residents of The Mission, Sausalito, Tiburon, or hundreds of other towns. However, “The Housing Crisis” calls for measures such as declaring the Bay Area an Economic Development District, where everybody produces their fair share of economic input/output, neighborhood wishes be damned. Here at the Nine-County Coalition we root for city and county control of housing development. But, should that include exercise of eminent domain to preserve neighborhoods? How about to preserve rent-controlled or reasonably-priced housing in older neighborhoods? Tim and Eva Jisser thought they were living the American Dream. They worked hard, and in 1986 bought the Buena Vista Mobilehome Park in Palo Alto, which they rented for reasonable prices to mobilehome residents -- all in hopes that some day they would retire comfortably as well as hand down a solid economic legacy to their children. They did not figure Palo Alto had other plans for them. Today, the Jisser Family if faced with the choice of forever maintaining a mobilehome park way past its economic prime, paying $20,000to each of the park’s 400 residents for the privilege of converting their property to other uses, or being subject to eminent domain exercised by the Santa Clara County Housing Authority. 1986 – Tim and Eva Jisser purchase Buena Vista Mobilehome Park from the owner at that time. 2001 – Palo Alto City Council passes law that places rent control and conditions for closing the park. 2012 – The Jissers file an Economic Development Review with the City of Palo Alto citing intention to close the park. Tim Jisser wishes to retire, the park is showing wear and tear after 30 years of operation, and the remaining economic life of the park is only about 10 years. They do not wish to sell the park, but to keep it in the family to partner with a developer to create a larger housing development. 2015 – On May 26, after three years of paperwork, the City of Palo Alto approves the closing of the park, under the condition the Jissers pay each of the park’s 400 residents $20,000, for a total of $8 million. * The required payment of $8 million is not related to public costs caused by the park’s closing, but an attempt to make the Jisser Family pay to mitigate the City’s lack of affordable housing, in violation of the Takings Clause of the Fifth Amendment and the Fourteenth Amendment to the U.S. Constitution. * Under Cal. Gov’t Code § 65863.7, a local legislative body, such as Palo Alto’s City Council, may take steps to mitigate adverse impacts of mobilhome closures, but such steps shall not exceed reasonable costs of relocation. Unrestricted payment of $8 million is not reasonable. * As applied to this case, the Palo Alto ordinance requiring mitigation for the public good, offers no public good derived from the payment of $8 million, since the money goes directly to specific individuals (the tenants) with no restriction as to what they may do with the money. 2016 – On January 5, The City of Palo Alto files motion to dismiss the case. 2016 – On June 27, the Jisser Family files an appeal with 9th Circuit Court. 2016 – On June 15, Santa Clara County Supervisor Joe Simitian, City of Palo Alto Mayor Patrick Burt, andSanta Clara County Housing Authority Executive Director Katherine Harasz hold a press conference. Supervisor Simitian says the County is committed to guaranteeing that the residents of Buena Vista enjoy the economic opportunities found in Palo Alto. Mayor Burt says support for saving the mobilhome park is widespread. Director Harasz opines that housing is infrastructure, just like bridges or highways, and can legally be produced via the exercise of eminent domain. 2016 – On June 27, the City of Palo Alto, Santa Clara County, and the Santa Clara County Housing Authority publish a Memorandum of Understanding, describing how they will pool money intended for affordable housing for the purpose of purchasing the Buena Vista Mobilhome Park. 2016 – On December 21, the Santa Clara County Superior Court on a case filed by residents of the mobilehome park claiming $8 million was not nearly adequate relocation costs ruled the City of Palo Alto must determine the exact relocation costs of each of the 400 residents of the mobilehome park before the park could close. Whose problem is it that homes in Palo Alto are unaffordable? The City of Palo Alto says its requirement that the Jissner Family pay a total of $8 million to residents is fair, since if evicted, residents would have to pay much higher housing costs than they do now. How is ensuring the well being of 400 specific individuals public good? The United States Constitution allows for government taking private property for just compensation for the public good, such as building railroads, bridges, or highways that anyone can use. Is any property safe from either regional one-size-fits-all mandates, or neighborhood preservation? Probably not as long as regional bureaucracies keep growing or powers of eminent domain keep expanding. Is any tenant safe from eviction? Never, but the chances of eviction can be greatly diminished by repeal of draconian land use limitations that force a great number of individuals into small spaces. Maybe the bureaucrats who came up with Priority Development Areas and transit corridor density should themselves pay the $8 million required by the City of Palo Alto. Young adults living with their parents is not a new phenomenon. It was the norm in the early 20th century. However, today, the trend seems to be worthy of casting blame on everything from student debt to techies. How about flinging some aspersions on “sustainable communities,” such as Plan Bay Area? One of the hallmarks of sustainable communities is transit-oriented development, here described by the Bay Area Metropolitan Transportation Commission. Transit-oriented development, or TOD for short, refers to the clustering of homes, jobs, shops and services near rail stations, ferry terminals or bus stops with high-frequency service. Studies show people are more likely to ride transit if they live within half a mile of a rail station, ferry terminal or bus line. And jobs that are within a quarter-mile of transit often are more attractive to prospective workers. Clustering in Priority Development Areas where TOD takes place is accomplished by designating large swaths of highly restricted Priority Conservation Areas, and is aided by the presence waterways, marshland, and hillsides. The Bay Area covers approximately 4.4 million acres (around 6,875 square miles). 1.1 million acres are reserved for parks and preserves. 2.2 million acres are zoned for farms, hillsides, and rural development. That leaves only 1.1 million acres of Bay Area land available for TODs. All 7.65 million Bay Area residents must fit into about 1,719 squares miles of space. Although major cities in the Bay Area claim to have “created” thousands of jobs, which caused in-migration of workers seeking those jobs, out-migration is also occurring. Bay Area residents frustrated by high costs and traffic jams are leaving in comparable numbers to those that are arriving. So, the perceived crowding is more due to TOD policies that result in limited growth areas with high population density than to in-migration. * Protected land leaves relatively small development areas. See map: Green and yellow areas are protected in one form or another. Gray areas are living space. * Tax incentives attract companies that need workers. * Workers compete for resources within limited land areas, bidding up costs. * Increasing resources (in-fill, build up) solves the supply/demand challenge. * Costs, traffic gridlock, and bad public transit push people out, resulting in a raft of concerns. * Resources do not increase sufficiently to bring prices down. Housing becomes unaffordable for all. In such an environment, an increasing number of young people cannot afford housing. The alternatives are migrating to areas where costs are lower, living in crowded quarters with several roommates, or coming home. It appears many are choosing the latter. Everyone wants some open space, protection of principal marshlands, and preservation of our farms and ranches. The challenge is crafting a realistic balance between those objectives and the economic well being of residents. One of our newly-minted State Senators, Scott Wiener, spoke with the San Jose Mercury News. ...He announced that he is preparing a bill that would create a set of new rules that, in the end, would require, not urge, California communities to build housing, some of which would have to be “affordable." ...What about a place like San Mateo County where the geography is about 75 percent open space? Does he envision using at least some of that pristine territory for housing? No. He said that’s not what he foresees going forward. “Housing should be placed where housing already exists,” he said, adding that a municipality’s zoning rules would not be tampered with. Reminder: Mandated transit-oriented policy is not a part of a municipality's zoning rules. 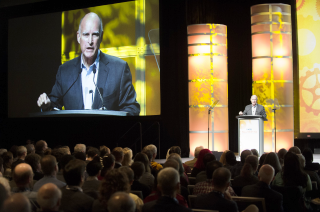 California’s Governor Jerry Brown delivered one of his best rants ever on December 14, 2016, before the annual gathering of the American Geophysical Union. In defense of continued research into climate change, Brown roared, "If Trump turns off the satellites, California will launch its own damn satellite.” "We've got the scientists, we've got the lawyers and we're ready to fight." Brown is not kidding! He has been fighting and raising the ante on reducing greenhouse gases since the 1970s, when he received and since proudly wears the nickname of Governor Moonbeam. This brings us to one of California’s latest adventures: development of an interstate power grid. January 2015 – Jerry Brown’s inaugural address included clean energy goals for 2030. February 2015 – “Clean Energy Bill” introduced to the California Legislature rules committee. September 2015 – SB 350, “Clean Energy and Pollution Reduction Act of 2015,” passed. October 2015 – SB 350 signed by Governor Brown. The mandates of SB 350 are ambitious and extensive. However, the game changer appears to be the transformation of the ISO into a regional organization. The regional plan is different from the current Energy Imbalance Market (EIM), established in 2014, under which individual utility participants across eight western states buy and sell energy from one another to help balance their supply and demand. Under SB 350’s plan, instead of individual utility grids, there would be one big grid serving several western states. PacifiCorp, owned by Warren Buffett, is a major player in the regional plan, and operates coal-fired power plants in Idaho, Oregon, Utah, Washington State, and Wyoming. Therefore, concerns have been raised about “dirty” energy. SB 350 and CA ISO view grid integration with neighboring states as expanding California’s grid, which would mean other states accepting California’s numerous environmental and other rules. Whether neighboring states would also embrace such view is now questionable. California might face the necessity of losing some of its autonomy and beloved rules in order to implement a regional grid. On August 8, 2016, Governor Jerry Brown wrote a letter to leaders of the state legislature indicating that there are unresolved issues with the transmission proposal that could not be resolved during the current legislative session. There was no mention of what those unresolved issues are, but one can surmise “dirty” energy and loss of autonomy would be among them. On December 15, 2016, the Imperial Irrigation System filed in the Superior Court of Alameda a petition for writ of mandate to obtain records from the University of California at Berkeley on studies UC supplied to the California Legislature. The point of the lawsuit is that the studies may not have been all that objective, and that the CA ISO was supposed to operate as a non-profit (Warren Buffet’s PacifiCorp hardly qualifies). The regional grid proposal beautifully illustrates the principal argument the Nine-County Coalition tries to communicate: regional governance might provide economies of scale, but carries significant loss of autonomy. There is enough material worth of discussion in SB 350 to fill volumes. Perhaps on a future discussion, we can address cost! Educators have used this cartoon to illustrate the problem with undifferentiated assessments in education. Can the principles of differentiated assessments be effectively and justly applied to neighborhood character? Is HUD about to be surgically altered? “We are deeply concerned by the nomination of Dr. Ben Carson to serve as Secretary of Housing and Urban Development. Dr. Carson lacks any experience in housing policy or community development. Statements we all make reflect our assumptions. Therefore, we would like to consider what assumptions might be discerned in the comment by Ms. Clarke. Since the 1930’s Congress and the President established ten major housing agencies. Some were replaced, some consolidated, some ceased operations, and all produced hundreds of sub-agencies and departments. All administered thousands of programs. After more than 80 years of supposedly “experienced” leadership populating numerous housing agencies and programs, there is still constant talk about dire need to reduce homelessness, assist segregated economically-disadvantaged areas, and increase home ownership. Assumption #2: “Community development” is an essential function of government. As a nation, we have moved from “negative rights” to “positive rights.” Negative rights entail someone being left alone to succeed or fail according to his abilities. Positive rights entail a second party doing something to affect someone’s success or failure. Community development used to be organic growth, where no one interfered with someone opening a shop to sell goods a community needed, or someone offering to drive folks from one place to another. However, the term nowadays means a second party (taxpayer, property owner, landlord, shop owner, etc.) doing something, under the enforcement of a third party (government). The evolution of positive rights coincides with the growth of housing agencies. And we are still struggling with homelessness, segregated neighborhoods, and homeownership dwindling from the middle class. Assumption #3: There is no downside to the ruling that disparate impact claims may be brought under the Fair Housing Act. Disparate impact refers to unequal effects of applying equal assessments. Example most used: If a fire department applies the same weight carrying test to male and female applicants, female applicants would be disparately impacted, given males’ usually stronger upper body. Allowing claims under disparate impact ignores the Constitution equal protection clause, places the burden on defendants to prove their actions are essential to the process (say, all firefighters must be able to carry people out of burning buildings), allows further arbitrary interpretation of laws (say, proving action is essential to the process is not enough; the process itself must be modified). Assumption #4: There is no downside to HUD’s Affirmatively Furthering Fair Housing rule. The rule requires all communities that receive HUD grants to be integrated by race and economic level, which requires heavily subsidizing less affluent people to enable them to live in affluent communities. Higher taxes to provide funds for such subsidies will not be popular with those who must pay them. How about removing impediments to innovative educational systems, allowing the job market to grow in whatever manner it serves everyone (just choose not to purchase goods made by child labor, for example, and child labor will not exist), and respecting all work (someone who loves tinkering with cars might be happier in vocational school than in four-year university). Might those strategies benefit everyone's neighborhood? Assumption #5: Proactive measures taken by government ensure successful achievement of objectives. The “legacy of residential segregation” arose largely by proactive measures taken by government following World War II. It is not farfetched to assume that new proactive measures might bring equally horrendous results. A fascinating memo archived in the Special Collections Department, Langsdale Library, University of Baltimore, quotes parts of the Federal Housing Administration Underwriting Manual 1934 to 1962. The memo refers to race as a factor in determining value of property, and indicates that in order to keep the value of homes up during the life of mortgages, “adverse influences” like “inharmonious racial or national groups” must be kept out of neighborhoods by means of zoning and restricted covenants. By “inharmonious” the manual means non-white. From the pre-1968 Federal Housing Administration Manual. Courtesy of archives of the University of Baltimore. When we read any statement in the news, it might be good practice to pay attention who the speaker is and what are the assumptions apparent in the speaker’s statement. Do the assumptions stand up to scrutiny? For background on this saga, please see our post below “Project Labor Agreements - Why the Clamor Pro and Con?” The Mercury News provided a good update. On November 30, 2016, the Board of the San Francisco Bay Restoration Authority voted in favor of requiring project labor agreements (union only jobs) for construction work of $500 million or more. Given that most work on Bay restoration is likely to cost a lot more than that, we can safely assume that non-union contractors need not apply. The Santa Clara Valley Water District loaned the Restoration Authority $1.5 million to help the Authority qualify Measure AA for the November 2016 ballot. The District uses the Army Core of Engineers to do its flood control work, and the Core does not recognize project labor agreements. So, after protestations, the District was exempted from PLAs. The East Bay Regional Parks District expressed concern that although President Obama’s administration supports project labor agreements, the next administration might not, creating challenges in working with federal agencies that own parts of the Bay wetlands. Kevin Dayton, president of Labor Issues Solutions, pointed out that the decreased competition resulting from the PLAs will most likely increase costs. He also noted, “It’s disappointing that voters voted on that parcel tax without knowing the board was going to give the unions a monopoly,” Indeed, PLAs were probably not on the mind of most small local contractors that voted “Yes” on Measure AA hoping for jobs – although it should have been, given that major Bay Area cities like Oakland and San Francisco have strong union-only requirements. "Plan Bay Area’s autocratic character is rooted in the un-democratic governance of the regional agencies under whose aegis it proceeds, the Metropolitan Transportation Commission and the Association of Bay Area Governments. Both entities are putatively overseen by unelected officials—to be precise, elected officials (mayors, city council members, and county supervisors) who were not elected to serve on MTC or the ABAG Executive Board. It follows that when they run for office or re-election, their positions on Plan Bay Area and the regional agencies’ other projects never come up." Project Labor Agreements - Why the Clamor Pro and Con? “The Authority has compiled a list of numerous projects eligible for funding under Measure AA. high-quality projects built with a properly trained workforce and completed in a timely manner. council that sets forth the terms and conditions of employment on a construction project." As Sam Schuchat says in his memorandum of November 23, 2016, addressed to the SFBRA Governing Board, recommending that a Project Labor Agreement be adopted, “A project labor agreement (PLA) is an agreement between a project owner and a local building and construction trades council.” In this case, it would be an agreement between the San Francisco Bay Restoration Authority and various labor unions. Mr. Schuchat cites quality work and workers’ benefits as reasons to require a PLA for construction work undertaken by SFBRA; however, if pressed, he would probably mention the federal Davis-Bacon Act and the California Prevailing Wage Law. Although Davis-Bacon, the California Prevailing Wage Law, and Project Labor Agreements are crucial elements of public works projects, usually the general public – who pays for these projects – is unaware of the high stakes involved. Here we offer some historical background and details that we hope might be of interest. Back in the 1930’s, as the Great Depression and unemployment deepened, then President Franklyn D. Roosevelt unleashed the incipient force of federal power in an effort to put people back to work. At the center of the nation’s restructuring were the Public Works Administration and the Works Project Administration, financing major construction as well as small-scale projects. Therefore, a substantial number of jobs created were in construction. As market forces would dictate, workers migrated towards opportunities and adjusted their expected wages as necessary to benefit from the opportunities, often outbidding those not quite as flexible. Many of the migrants were non-white and relatively unskilled due to training barriers. Events culminated with the passage of the Davis-Bacon Act of 1931, a federal mandate which requires projects funded or assisted by the federal government to pay “prevailing wages” for each job classification in the project’s locality. Following the federal example, many states enacted “Little Davis-Bacon” acts containing similar requirements to those of the federal act. California’s Little Bacon is the California Prevailing Wage Law. During the November 2016 Elections someone said, “NO on Proposition K is something Berniecrats and libertarians agree on!” This proposal would have increased San Francisco sales tax to 9.25%, sending buyers out of town to do their shopping, proportionally penalizing lower-income residents, diverting even more money from basic City services to homelessness. San Francisco’s Proposition K had additional problems. It was tied to Proposition J on the same ballot, which would create two new funds by charter amendment, the Homeless Fund and the Transportation Fund. The City already has a Transportation Fund, so the new item was the Homeless Fund to the tune of $12.5 million to support the 2016-2017 budget. That’s right, money is already needed to prop up the current astonishing $9.6 billion budget. Residents are sensing that throwing money at homelessness does not work. A study published shortly after the November Elections could support voters’ suspicions. The study indicated that homelessness decreased by 14% since 2010 nationwide, but increased by 5.8% in San Francisco. Defeat of Proposition K shows that coalition around issues of common interest works. Businesses, political parties, progressives, libertarians, tax groups, and especially transportation advocates just said no. Ideology and partisanship need not hinder collaboration. "It took some real effort on the part of regionally-oriented elected officials…to force a consideration of the true regionalism and mixed jurisdiction regionalism." Persistence is an admirable trait, but at times it can turn into peskiness. Bay Area residents who are happy with their city, county, and state jurisdictions, might feel that the persistence of advocates for regional governance has morphed into downright peskiness. Before there was Measure AA in June 2016 or the adoption of Plan Bay Area on July 2013, there were activist organizations which sprouted during the post-war era that lobbied for integration of Bay Area transportation, land use, and environmental efforts. Specialized organizations, such as the Greenbelt Alliance, Save the Bay, and the Metropolitan Transportation Commission survived. More ambitious efforts died in the vine, but served to pave the way for other regional endeavors. Bay Vision 2020 is an example of a “failed” plan that succeeded admirably in normalizing the concept of regionalism. Principal movers and shakers that today advance the cause of regionalism are rightful heirs of BV2020. Here we offer a brief narrative of BV2020 and one of its foremost heirs. Established in 1989, the Bay Vision 2020 Commission stands out as particularly bold in its intent not only to integrate functions but also governments. This commission’s history is fascinating enough to have given rise to detailed case studies and to have left us with some understanding of the ultimate aim of regionalism -- a change in the current structure of governments -- as Joël Thibert discusses in Governing Urban Regions Through Collaboration. "When the regional organizations were created back in the late 1960s and 1970s … they were really created to thwart regionalism. They were really created to protect local jurisdictions’ authority and protect local control over the single issue… It took some real effort on the part of regionally-oriented elected officials…to force a consideration of the true regionalism and mixed jurisdiction regionalism." Rod Diridon, as quoted in Thibert's book. Rod Diridon, who held posts in both regional agencies (MTC and BAAQMD) and county councils (Saratoga and Santa Clara), was instrumental in the formation of the Bay Vision 2020 Commission. The commission differed from previous efforts at implementing regionalism from the start. It excluded elected officials, lacked an objective to address one specific challenge (for example, need for clean water), and aimed at passing enabling legislation to address a laundry list of diverse issues. In other words, the commission was formed, Thibert observes, to reform government, rather than to tackle a specific regional problem. Since the Big Bank Bailout of 2008, institutions like JP Morgan and Goldman Sachs have suffered tarnishing in the public’s mind. News that Wells Fargo Bank employees were so driven that they resorted to opening fake accounts did not help the big-bank image. To that, add investments in industry sectors some people consider unacceptable, sizeable corporate contributions to political campaigns, and continued just plain bigness, which will call for bailing out again during the next inevitable downturn. So, what to do? Stay with a big bank for the convenience of ATM’s everywhere and services of every imaginable kind, or move to another alternative? Judging by the existence of alternative banking, it appears some folks have taken the plunge. Part of the mission of the Nine-County Coalition is to offer alternatives where things do not feel quite right. Therefore, here is a brief summary of alternatives to traditional big banks. Of special interest might be the “public bank,” of which there is only one in the entire United States. Community banks: Small, locally owned, invest in their community and not across state lines, provide more personal service, can be state or federally chartered. State-chartered banks: Regulated primarily by state agencies familiar with local challenges and strengths, have comparable powers to federal institutions in all areas of operation, can choose not to belong to the Federal Reserve system, but can belong to the FDIC. Internet-only banks: No brick & mortar so substantial costs savings to pass on to customers, offer banking stability to people who travel or relocate often, many absorb the cost of customers using other banks’ ATMs to withdraw cash, lots of free services. What does "local control" mean? Is "Local" a Made-Up Word? At their board meeting of September 27, 2016, San Francisco Supervisors passed Resolution 161044, calling for San Francisco agencies to "monitor and review any development proposals for the Brisbane Baylands Area." News outlets reported the backstory that the Supervisors discussed the annexation of Brisbane. But doesn't Brisbane have local control?! Read on. What does “local” mean? What does "local control” mean? Our articles on the Nine-County Coalition sometimes call for “local control.” Proponents and opponents of ballot proposals, having caught on to voters’ desire to eliminate federal mandates such as Common Core or to prevent legislators from taxing them into homelessness are using variations of “local control” in their appeals. Here are three examples from the California voter’s guide. • Lawful political jurisdictions are city, county, state, and federal. Reference to local, regional, and global areas as if they were lawful jurisdictions is unwise. • We the people require established legal political jurisdictions in which to exercise our legal political power. If we allow legal political jurisdictions to blur, our legal political power is also blurred. • We have lawful authority in an incorporated city, unincorporated county (dependent legal political subdivision of the State), State and federal governments. • Proof that we must guard our lawful political jurisdictions otherwise our lawful political authority will be gone: The San Francisco Board of Supervisors recently considered "annexing" the near-by city of Brisbane because it found Brisbane's development plans unhelpful to San Francisco. Development is a regional issue, they said. The November 2016 Ballot - Lucy Strikes Again! Remember Lucy from the Peanuts cartoons? Lucy’s favorite pastime was to fool Peanuts into believing she would hold the football still for him to kick. Does Lucy remind you of anything else besides Charles Schulz? How about California’s Proposition 55? San Mateo’s Proposition K? San Francisco’s Proposition B? Oh, we can go back in recent memory to 2008 and Proposition 1A, "The Safe, Reliable High-Speed Passenger Train Bond Act for the 21st Century." How is that easy commute working for you? The “Lucy Syndrome” permeates politics, and voters might benefit from awareness of that fact. As a political tool, the “Lucy Syndrome” is unparalleled. It helps pass ballot measures by making proposals – and the challenges they address – seem temporary and easily remedied. It provides unending sources of revenue while disguising needs as temporary. A more efficient and cost effective way to deal with challenges is to actually fix their underlying causes. Voters can help by remaining well informed and always holding their representatives’ feet to the fire. Although the Nine-County Coalition is primarily focused on the nine counties located in the San Francisco Bay Area, we attempt to provide context with material relating to state, national and international developments. One of several organizations discussing regionalism at the state and national levels is Sustainable Freedom Lab. Their website contains much information on how bureaucracies replace elected officials, how property based on distribution of resources replaces traditional private property, how misguided ideas of social justice replace rule of Constitutional law. Must-read on the SFL website are articles on HUD (the federal Department of Housing and Urban Development). If you have not yet carefully read requirements of the Affirmatively Furthering Fair Housing Rule, an executive order issued by President Obama implemented July 2015, we encourage you to do so. Mandates of the AFFH result in one-size-fits-all prescriptions for all communities, something no one ends up happy with. This personal San Francisco story of the Mission and what came to be called South of Market around the 1970’s , can be found in zRants, but variations on the theme can be found in countless communities characterized as artists, entrepreneurs, recent immigrants, or minorities. “Sweat equity” is the common currency. Prior to the early 1970’s, most communities still developed organically, as people gravitated to what they liked. There were neighborhoods of single-family homes with big yards, pads for flower children, and everything in-between. If a neighborhood got too crowded for some, they moved somewhere else. If residents’ fortunes grew and they moved to better neighborhoods, others moved in to create their own fortune. Then came The Planners, and everything was declared Unsustainable. In the Bay Area, although planners such as community redevelopment agencies had been wrecking havoc since the 1940’s (the most prominent instance of wrecking was the obliteration of San Francisco’s Old Fillmore District), The Planners did not reach their stride until The General Plan in the mid 1980’s. Each city formulated a plan, remarkably similar to one another. That not being enough planning, Plan Bay Area was approved – no peoples’ votes, just approved -- in July of 2013. Today’s Planners are obsessed with achieving their magical goal of Sustainability, no matter what it takes. If it takes a three-feet long voter’s ballot filled with proposals for parcel taxes, sales taxes, and bonds, so be it. If it takes bulldozing neighborhoods built on sweat equity, so be it. Should voters continue to feed the beasts unleashed by The Planners? The principal theme of today’s Bay Area central planners is “Sustainability.” What does that concept mean? How did that word become so ubiquitous? Often, past events give us a clue of present conditions. For those interested in events that preceded the current sustainability theme, we offer a time line, going back to 1864. Obviously, many other equally significant happenings could fit into this time line, such as Moshe Safdie’s Habitat, seen by 50 million people at the Montreal World’s Fair of 1967. Or Earthrise, the photograph of the Earth and parts of the Moon's surface taken by astronaut William Anders in 1968, during the Apollo 8 mission. 1872 – Congress turns over the Yellowstone areas in Montana and Wyoming to the U.S. Secretary of Interior as a public park. What is there not to love about eliminating blighted areas, providing housing, opening malls? Lots, if we are talking about “redevelopment” as the California Legislature has come to interpret the word. The “old” Redevelopment Agency, dissolved in 2012 at the urging of Governor Jerry Brown, has the distinction of going down in history as the instrument that during the 50’s and 60’s bulldozed the homes, businesses, livelihood, and rich culture of thousands of residents of San Francisco’s Old Fillmore District. Such rampage was duplicated throughout California, as other forms of “urban renewal” were replicated throughout the nation. That “unknown government” ended not because it was destructive, corrupt, wasteful, and beyond voters’ reach, but because Governor Brown was staring at $1.7 billion in budget deficits that could be remedied by eliminating funding for the Redevelopment Agency. Therefore, as soon as the California economy rebounded, calls for bringing back urban renewal sprouted like crabgrass. In 2015, AB2, Chapter 319, authorized cities and counties to create “community revitalization and investment authorities.” CRIAs are also known as mini redevelopment agencies. The agencies just got a boost in their workload with the passage of AB 2492, signed by Governor Brown on August 23, 2016. The bill declared that a community could be declared “blighted,” not only because the area is run down beyond remedy, but also because most of its residents are relatively poor. We are witnessing the development of a perfect storm. It is certainly rewarding to see one’s cause gain some press coverage. Thank you to John McDowell for mentioning the Nine-County Coalition in his article of August 9, on the San Mateo Daily Journal, Stuck in the Zone. The article is a good summary of the many parts coming together in building the engine of regionalism, multiplying a maze of unreachable bureaucracies, while spinning tales of benefits and transparency. Stuck in the Zone alludes to Rod Serling’s yarns of the 5th Dimension. We wonder if regionalism has gone even further – into the labyrinths of Franz Kafka. Have bureaucracies as the one pictured below become leaner, and that is why we don’t see such offices any more, or have bureaucracies simply become powerful enough to demanded more space? We would bet the latter. We are stuck in the zone, albeit a more spacious and spruced up one. Permit requests only on the 5th floor. Pick up of permits on the 9th floor. Requiredstamping (mornings) on the 2nd floor. Building has no elevators. Walking is good. The San Francisco Bay Area is experiencing a “housing crisis,” resulting in great activity from many quarters offering solutions. Veritable movements have sprung up with plans for a better tomorrow. Behind every movement there are people driving the movement. For example, history has it that the prohibition on landfill around the San Francisco Bay was the result of three feisty ladies getting together back in the early 60’s to find a way to stop the big corporations of the time from making more land on the Bay’s waters -- by using sand, garbage, sunken ships -- and then building on the landfill. The dominant corporations in the Bay Area are technology companies, such as Google and Tweeter. They are labor intensive, and their workers need to live somewhere. In the heyday of factories and mills, there were “company towns” built and paid for by companies. Today, there are not. Governor’ Browns response to the call to mitigate regulatory barriers is his Streamlining Affordable Housing Approvals trailer bill, which would override building permit rules of local cities and counties, including environmental hazard rules. All buildings settle a bit, but the South of Market 58-story luxury-condo Millennium Tower has sunk 16 inches into its bed of sand and tilted 2 inches northwest since its completion in 2009. A lot of San Francisco is built on sand. However, today the Federal Transit Administration tells the States and its people how they must manage their entire transportation system, in a down side up view of powers. For example, FTA policy says that Metropolitan Planning Organizations (MPOs) “are required to represent localities in all urbanized areas (UZAs) with populations over 50,000.” Say, if Napa County wants to build some roads within their county, Napa must register with our regional MPO (which is the Metropolitan Transportation Commission), and stand in line for their plan’s approval and for funding. The “and for funding” part might bring to mind the old saying “He who pays the piper calls the tune.” If the federal government contributes federal funds for local – not interstate – infrastructure, federal mandates that directly affect localities should be expected. Mandates such as MPOs result in power shifts from cities, counties, and states to regions. Cities, counties, and states are made up of elected officials over whom voters have power. Regions are not. Here at the Nine-County Coalition, we hope that an increasingly wider circle of ordinary citizens concerned with the downsides of regionalism discuss the issues, find solutions to challenges, and eventually start affecting legislation designed to restore power of voters at the ballot box. Prior to Proposition 218, the local resident and property owner's role in approving most new local government revenue-raising measures was minimal… locally elected governing bodies held most of the power over local revenue. Proposition 218 shifts most of this power over taxation from locally elected governing boards to residents and property owners. In order to fulfill this considerable responsibility, local residents and property owners will need greater information on local government finances and responsibilities. The people of the State of California hereby find and declare that Proposition 13 was intended to provide effective tax relief and to require voter approval of tax increases. However, local governments have subjected taxpayers to excessive tax, assessment, fee and charge increases that not only frustrate the purposes of voter approval for tax increases, but also threaten the economic security of all Californians and the California economy itself. This measure protects taxpayers by limiting the methods by which local governments exact revenue from taxpayers without their consent. PLF urges review of the decision of the Fourth District Court of Appeal in California Cannabis Coalition v. City of Upland, 245 Cal. App. 4th 970 (2016) (CCC v. Upland). Review is proper under Rule of Court 8.500(b)(1) because the case raises an important question of law that this Court should resolve. The question is whether the proponents of a new tax can evade constitutional prerequisites by introducing the tax as an initiative rather than a resolution of the governing body. The lower court held that taxes imposed by initiative are exempt from Article XIIIC of the California Constitution. Id. at 974. Under this ruling, local governments need not apply the constitutional requirements applicable to new taxes—a vote of the electorate in a general election. The Howard Jarvis Taxpayers Association contends that at issue is not just “a vote of the electorate in a general election,” but all safeguards contained in Proposition 218. The 4th District Court ruling is bizarre, and if allowed to stand it would eliminate the intent of Proposition 218. Any proponent, including governing bodies, could team up with powerful special interest lobbies to pass a tax via an initiative. We recommend that voters who wish to retain their power to decide how and by whom they will be taxed support the efforts of the organizations working to overturn this 4th District Court ruling. By Right Housing Approval - Why the Clamor Pro & Con? Much legislation that originates in the state or federal legislatures often weakens local control. Such proposals pass based on promises of benefits – or threats of withholding benefits – in exchange for some transfer of power. Governor Jerry Brown introduced one such proposal as a rider to the California State Budget 2016-2017, Streamlining Housing Approvals. $400 million for affordable housing programs is contingent upon passage of the rider. Although the budget was approved on June 15, this rider is under discussion as of today July 1, and amendments are being submitted. The challenge facing Jerry Brown is that communities want what they want, and will find a way to get it. The permitting process is a tool in the arsenal. Communities that want lots of affordable housing will use the process to negotiate affordability issues with developers. Communities that do not want lots of affordable housing simply delay permits indefinitely. But development costs soar as a result of delays, and groups that want increased supply to bring housing costs down see nothing happening. So, Governor Brown decided on a "one size fits all" mandate from above. One would think there would be a less convoluted way for communities to maintain local control of their neighborhoods. Perhaps allow neighborhoods to determine their zoning needs and provide ways for neighborhood groups to negotiate with developers in good faith? Top of the news today, June 24, 2016: Brexit! The majority of voters in the United Kingdom voted to leave the European Union, and the markets and press are not happy at all. Why would Bay Area voters concerned with regionalism pay attention to this event? The connection should be clear; voters in the United Kingdom want a say in what happens to them, just like voters in the four Bay Area counties that rejected Measure AA. Democracy only works if you know who your representatives are. Designed so that great masses of people could not control government ever again. We are being asked to give up the power to govern ourselves. They really do believe that trinkets are going to buy us off. Pooled sovereignty: It is bolix!